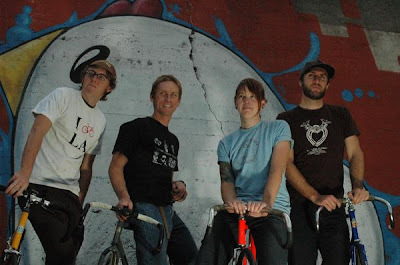 I went to the 7th Annual Bicycle Film Festival here in LA this weekend, and saw a wonderful short documentary about 4 Los Angeles vegan cyclists who decide to compete in the famous Furnace Creek 508 bike race...on their fixed-gear bikes!! This is a relay-style, 48-hour, 508-mile race that goes through Death Valley, with total elevation gain of 35,000 feet! The documentary is called "Eat! Sleep? Bike! ", directed by Sasha Edge Perry, and I highly recommend it to anyone who gets a chance to see it. Them LA fixie riders are tough! Hej, I didn't know there's an annual Bicycle Film Festival.